Saturday morning I got a call from Mandy inviting me for supper and a spend-the-night over because John was trying out his new waffle toaster for a breakfast brunch the next morning. Eva Cate got on the phone and wanted me to come play with her and Jake. A grandmother can’t turn down an invitation like that…good food, good company. Most of us probably (hearing this phrase for the first time) interpret this quote as meaning to show our faith by sharing it with others through deeds over talk. According to most dictionaries a “sermon” can be defined formally or informally. A sermon is a speech, usually religious in nature, given by a priest, preacher, rabbi, or other religious leader as part of a service. Although most sermons focus on Bible passages, you can use the word sermon more generally to refer to any speech that contains a moral or insightful lesson on life in a more informal setting. This second definition brings us to the title picture of Jake and “Donkey” looking rather despondent and reflective yesterday morning when I found him lying on the living room floor staring out the side windows by the front door. 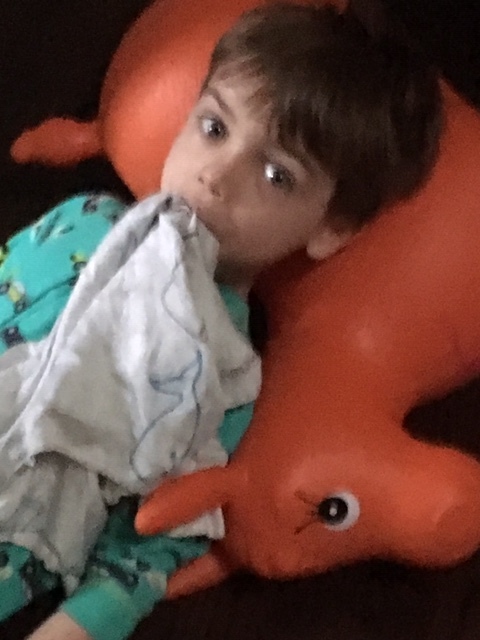 So Jake positioned himself on the floor with “night night” (his blankie) in his mouth lying on his beloved donkey and staring out at the early dim light of an overcast morning. The weather was not a deterrent for Jake. He was completely bewildered as to why anyone would want to sleep when it was obviously morning and time to rise and “shine.”. I draped a blanket around me and softly walked over to where he was and sat down by him. I didn’t say anything…I just waited to hear what he was going to say…and I got it…my “sermonette” for the day. 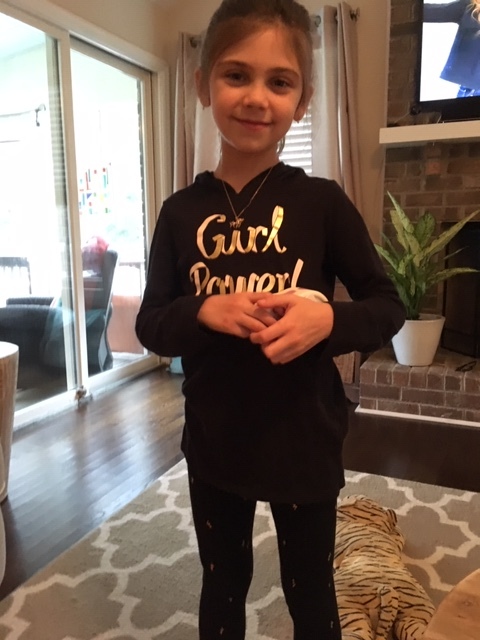 Life in the eyes of a four-year-old…is there anything better? 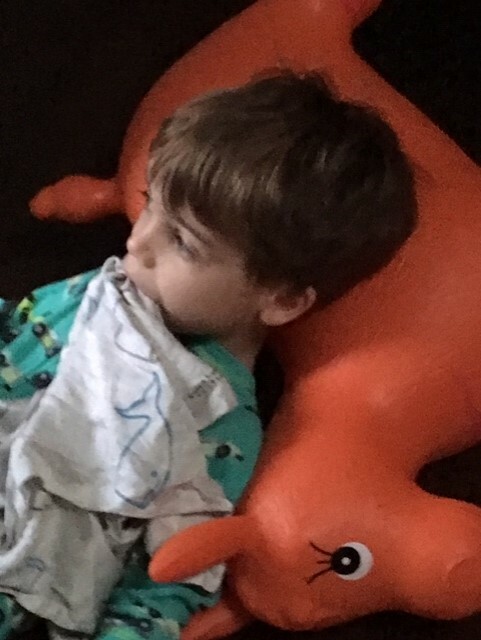 Jake always surprises me with his insights…the funniest one happened a few weeks ago while I was still hobbling around and hanging on to chairs from room to room….I saw Jake watching me and he seemed somewhat distressed. 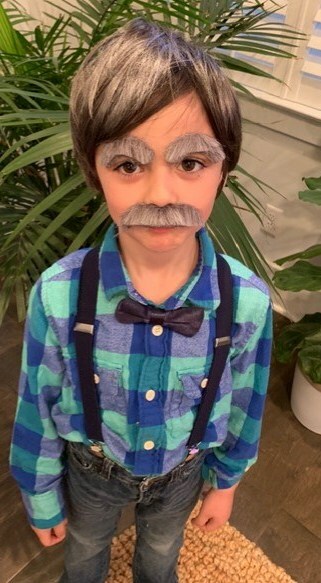 He thought about my response for a few seconds and then starting laughing and rolling over on the floor telling everyone “Boo Boo just got lucky to get old!” This thought tickled his funny bone apparently! Aren’t there “sermons” around us all the time as we go through each day? Sunrises and sunsets are some of the most spectacular sermons I have ever witnessed… along with the ordinary gifts of beauty (wildflowers in a jar, gardens, blue skies without a cloud, etc.) from God that touch us every day and lifts us up. So until tomorrow….If you wonder where God is…you need look no farther than the space and people who surround you on any given day. 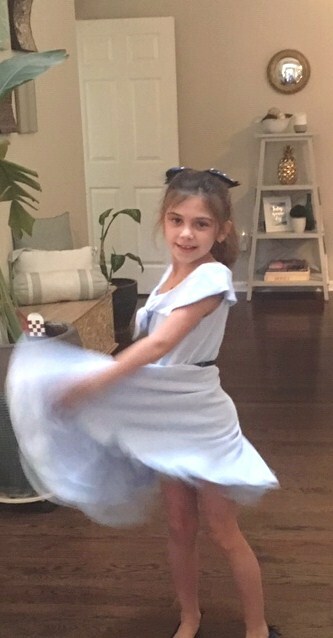 Eva Cate and I got some “girl talk” time and she modeled an adorable 50’s style dress Mandy got her for the American Girl musical show coming to Charleston next month. 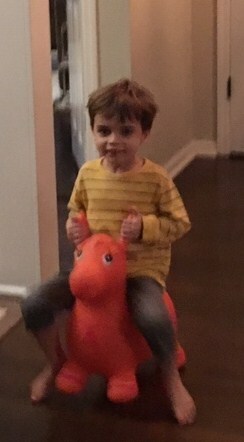 And Jake was just happy to be able to continue bouncing on donkey. I had to do a ‘double-take’ when I went in the kitchen and saw the latest message on the chalkboard. 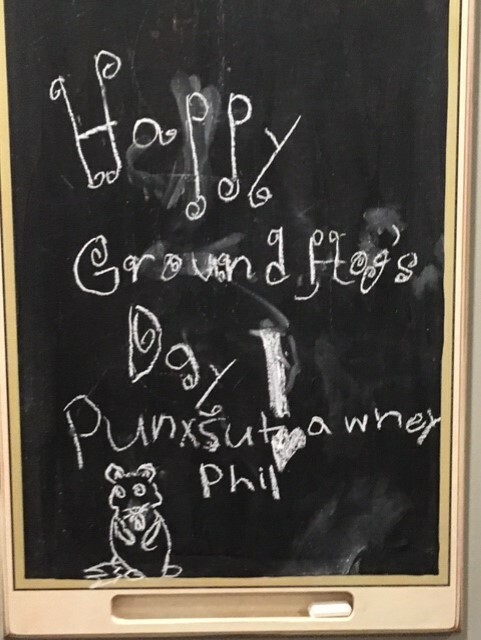 Eva Cate made her debut writing on it by announcing Happy Groundhog Day….Punxsutawney Phil…accompanied by her artistic rendition of a groundhog. *Eva Cate…your display must have brought us good luck since old “Phil” didn’t see his shadow so perhaps spring will come early this year. For us in the lowcountry…it is happening this week…we are leaving freezing temps at night and cool days behind to have some sun out again and temps in the 70’s this week! Children are so honest saying whatever they think or asking questions. When I turned 40, my oldest grandson, now age 35, asked me, with fear in his eyes, “Granny, are you going to die? He was eight, so 40 sounded ancient to him. I reassured him that I would be okay. Wonderful post, Becky. I do believe we have grandchildren to keep us humble don’t you? Apparently the sixties are not the new forties as advertised these days…though like you said…forty is ancient to children under 10! 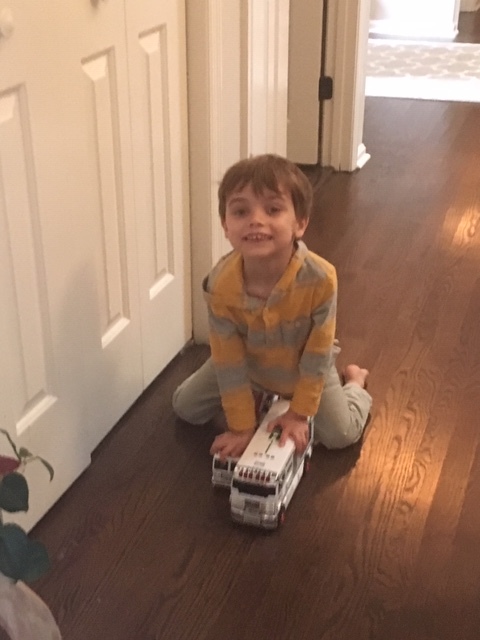 I know…Sometimes I feel like I need to run put on some make-up around Jake now if I see him staring at me too long….though cars and trucks fill his thoughts 99% of the time…thank goodness!